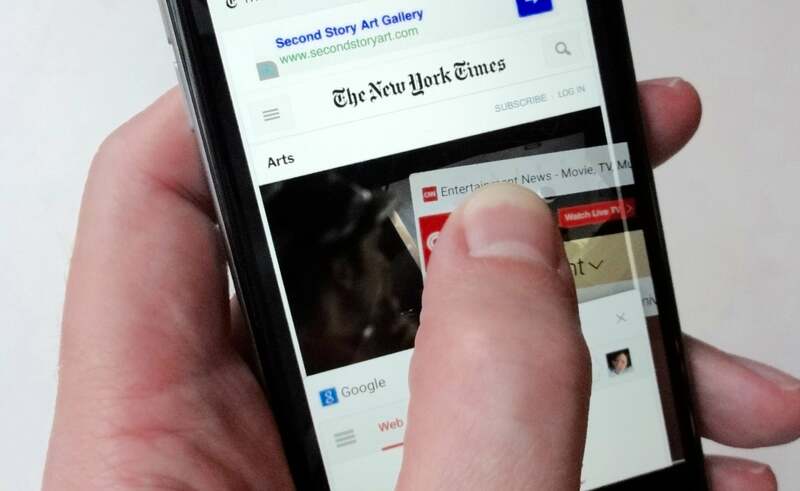 With Chrome on your phone, there’s no need to dig through menus or take aim at tiny buttons to make the most of your tabs and webpages. Instead, just swipe, flick, tap and hold, or tap and pull to open a new tab, close one you don’t need anymore, copy an interesting URL to the clipboard, reveal all your tabs, and more. To see all your open Chrome tabs at once, tap and hold the address bar (the one with the webpage’s URL), then pull it down. For a bird’s-eye view of all your open tabs, one option is to tap the square “Tabs” button in the top-right corner of the browser window. There’s also another, easier way: Just tap and hold the address bar (the one with the webpage’s URL), then pull it down. When you do, all your open tabs will slide into view. Just tap a tab to select it. Bonus tip: If you turn your phone sideways in the “all tabs” view, your open tabs will display onscreen horizontally rather than vertically. 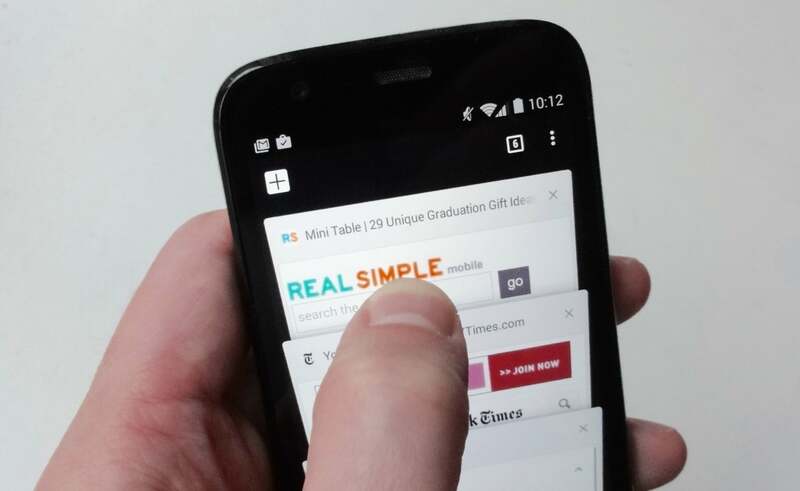 Closing an open tab in Chrome is as easy as a swipe. So, all your open tabs are now in plain view. To close some of them, you could tap the tiny “x” in the top-right corner of the tab, but (again) there’s a better way. Just flick any unwanted tabs away—left to right or right to left, whichever way you like. (That’s opposed to Safari for iOS, which lets you flick only one way to close an open tab). To cycle through your open tabs: On Chrome for Android (pictured), just swipe left or right on the address bar. On iOS, swipe in from left or right on the webpage itself, starting from the edge of the screen. Seeing all your open tabs at once is one thing, but what if you’d rather switch from one tab to the next without bothering with the bird’s-eye view? No problem. On an Android phone, just flick the address bar one way or another. When you do, Chrome will switch to the next open tab. Keep flicking to cycle through all your tabs, one at a time. Tap and hold a URL in the Chrome address bar for a handy “Copy URL” shortcut. There are a couple of ways to copy a URL on an Android device. That’ll work, but method two is a tad easier: Just tap and hold the address bar. When you do, a pop-up displaying the page’s full URL will appear, along with a “Copy URL” option. Tap it, and you’ll have saved yourself an additional tap. Here’s an easier way to open the Chrome menu: Swipe down in a curved motion from the top corner of the screen, slide down to the menu option you want, then release. The three-dot menu in the top-right corner of the browser is the home for a host of critical Chrome features—everything from opening a new tab and opening your bookmarks to sharing a page and searching for keywords. Aiming your fingertip at the tiny menu button can be a bit of a pain though, especially given that it’s so close to the “all tabs” button. 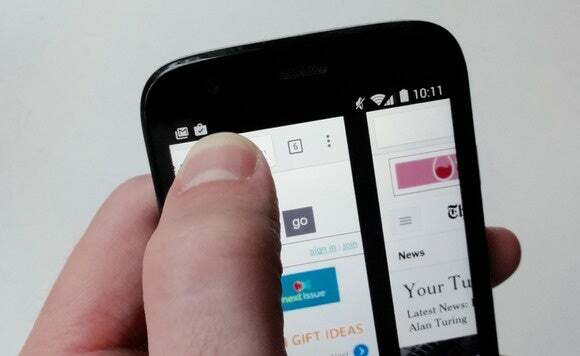 Instead, here’s a more elegant way of opening the Chrome menu: Sweep down from the top-right corner of the screen with your thumb or another fingertip (a gesture that, admittedly, is easier for those who hold their Android phones in their right hands). When you do, the Chrome menu will open—but don’t lift your fingertip yet. Instead, slide it to the menu option you want to select, then release, all in one smooth motion. 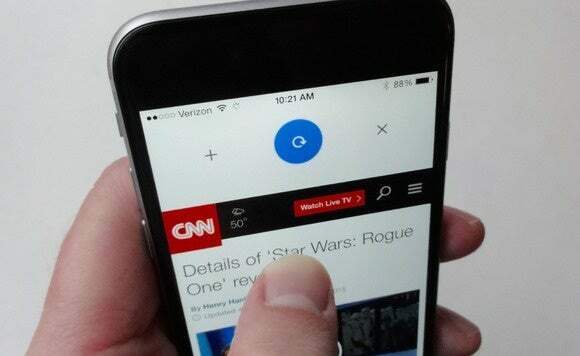 Pull down on a webpage in Chrome for iPhone to reload the page. You can also pull your fingertip a bit to the left to open a new tab, or right to close the current tab. For a quicker way to refresh a webpage, try this: Pull down on the page in question with your fingertip, then release when you see the circular “reload” symbol. But wait, there’s more—that is, if you’re using Chrome for iOS. When you pull down a page in Chrome for iPhone, you’ll see a couple of additional icons flanking the “reload” symbol: a “+” on the left and an “x” on the right. As you’re pulling down on the page, pull your fingertip a bit to the left, until the “+” sign is highlighted; doing so will open a new Chrome tab. Or, try this: Instead of pulling your thumb to the left, go right and highlight the “x” sign; that’ll close the active tab.